You may have seen the snazzy zooming satellite maps used by the broadcast news media to show some hotspot on the globe, sometimes being able to zoom directly to a particular location from a point in space. Maybe you would like to see your home, business, school, hunting camp, or shopping mall, being able to zoom in or out to meet your needs of the moment. Perhaps you would like to see a 3D image of a landmark, park or monument any where on the earth. Possibly you need local or long distance driving directions, and would like to see the actual landmarks along the route. All of the above functions and activities are now available utilizing a software product from Google called Google Earth, available at earth.google.com. There are three basic versions of Google Earth available, plus an Enterprise edition for heavy corporate use. 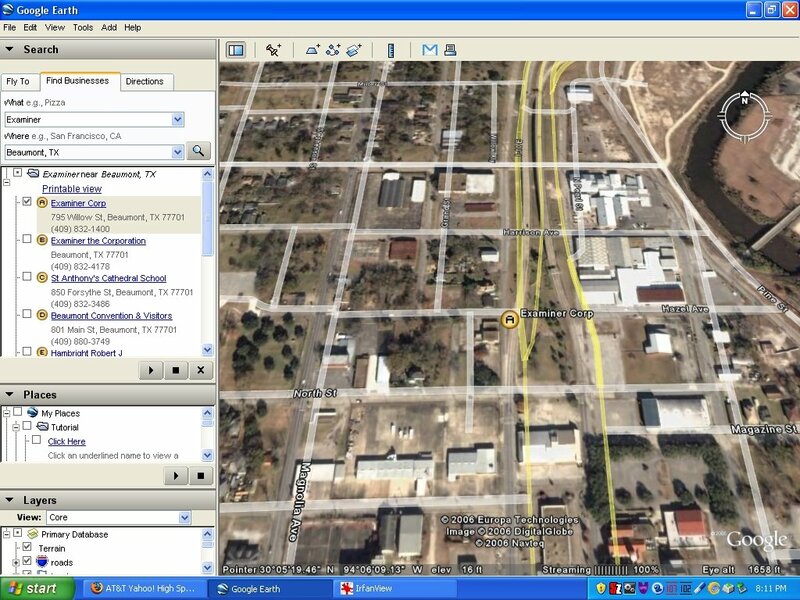 The basic version of Google Earth is available free for personal use, and serves as the core for the enhanced commercial version ($20), Google Earth Plus. The Plus version also has the ability to import data from major brands of GPS units as well as other data formats into the program. The top of the line version is Google Earth Pro, which is intended for commercial and professional use, but bears a price tag of $400. I downloaded and installed the free version of Google Earth (currently Release 4 Beta), and in the “Fly To” box I entered my home address. The starting image was of the Western Hemisphere as it would appear from space at an altitude of several thousand miles. Smoothly and swiftly, the image zoomed in, as if viewed from a meteor heading towards my house. First cities, and then streets, complete with names, appeared as an overlay (optional), as the software zoomed in to my house. The zoom stopped, showing my neighborhood and street from an indicated altitude of 3300 feet. At this scale my driveway, roof, and trees are visible, but fuzzy. Moving the cursor to the top right corner of the image causes a zoom bar to appear, allowing for the selective zooming in or out at will. Google explains that for thousands of cities around the world, the maximum resolution is one meter per pixel, which is equivalent to an aerial view from an altitude of just 1500 feet. For rural areas, such as where I live, the resolution is lower, but Google states that it is currently improving the resolution for many more locations. Another feature of Google Earth is the easy ability to show much of the globe in 3D, simply by using the slider across the top right corner of the image. Sliding to the right or left will tilt the image forward or backwards, providing the 3D effect. Many prominent and popular landmarks, which have been heavily photographed, such as stadiums, national parks, and major buildings, offer sharp and detailed 3D imagery. Some of the 3D images are in sharp natural color, while others are computer generated solid appearing grey images. 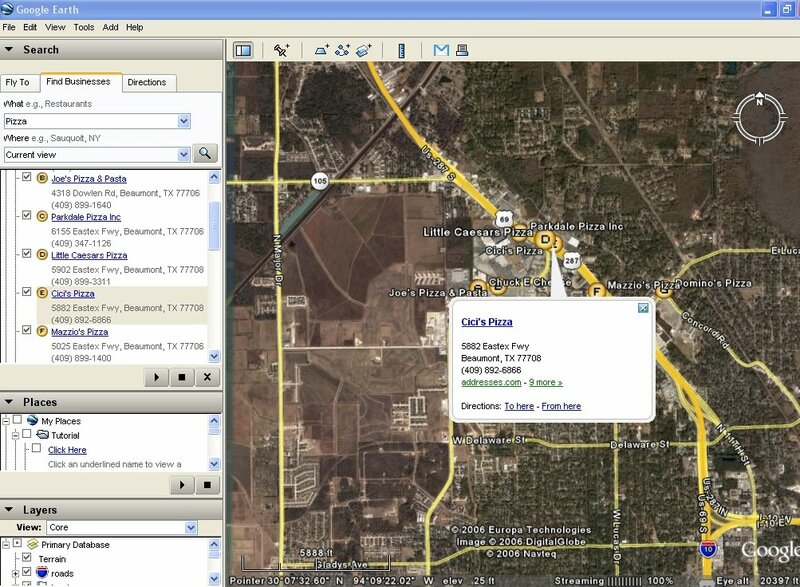 The Google earth series connects online to the Google search engine, which allows for the searching for a particular place or business. From the image of my home, I clicked on “FIND BUSINESS”, and for a quick test, I typed “pizza” in the search box. The satellite image with street overlay zoomed out, and quickly displayed the pizza parlors within a few miles of my house. On the left of the screen, as well as on the map itself, were the names and locations of the restaurants. Clicking on either opened up a small window with the address and phone number of the restaurant, complete with a link for driving directions “To here” or “From here”. If driving directions are selected by clicking on the link, a turn-by-turn route map is created, overlaid on the satellite image. Text based driving directions matching the map are displayed on the left side of the map. The map itself is easy to manipulate. A compass rose on the top-right of the image allows for the image to be shifted in any direction, and clicking and holding the left mouse button on the image will allow it to be panned in any direction. The location of the cursor itself gives the latitude, longitude, and elevation of the spot covered by the cursor. 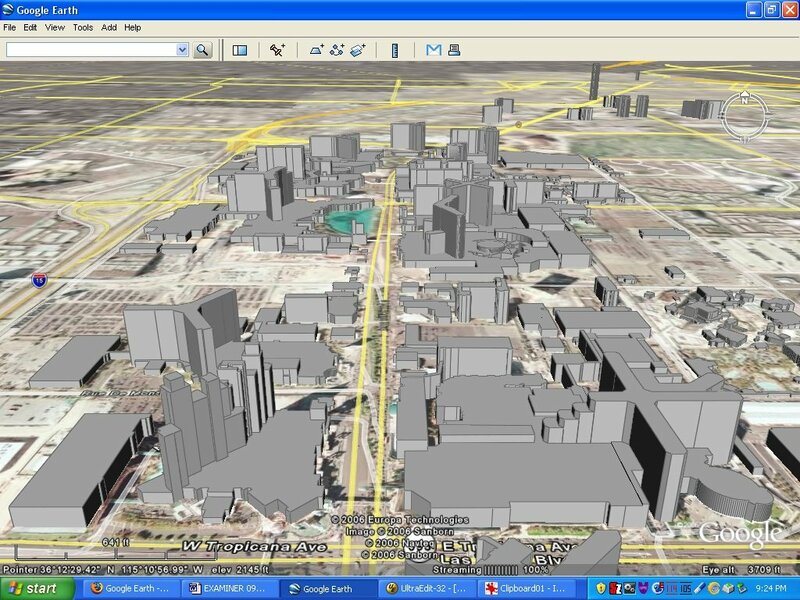 The “Layers” option on the bottom left corner of the Google Earth window allows the user to select which, if any, points of interest should be shown. Items which may be selected include gas stations, restaurants, lodging, shopping, transportation, parks, and other choices. I could imagine the great service that Google Earth can provide to a traveler. I could see myself at some distant hotel (with internet access), entering the name hotel in the “Business” box, or its address in the “Fly To” box. Then, by selecting the layer “Gas, Food, Lodging”, I could select the submenu “Dining” and then select the genre’ of food that I like. 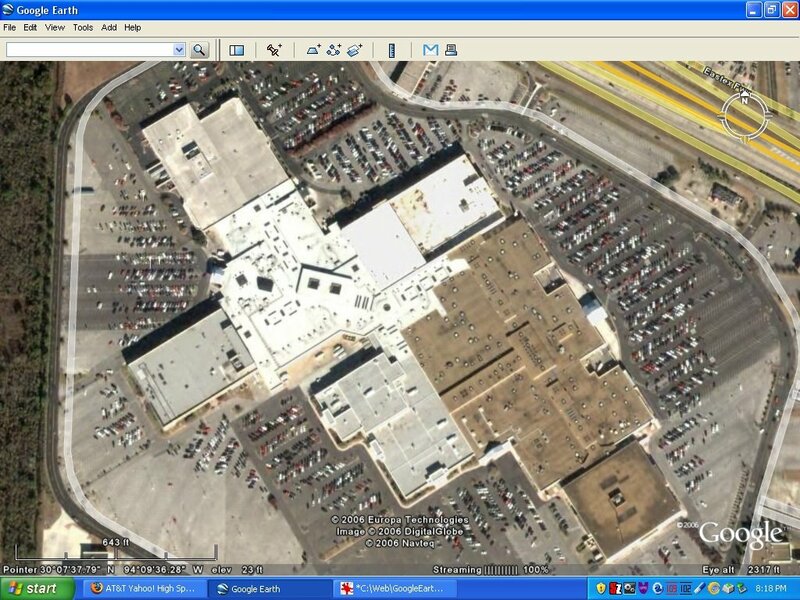 Google Earth will immediately display the nearby restaurants. Clicking on a restaurant will display a hyperlink where I can find more information about the facility, often including user ratings. Once a restaurant is selected, clicking on the “To here” link will generate both a graphical map and the textual driving instructions. Go ahead and try it. You may like it.